Did you know that apart from Lincoln Square's great Jibek Jolu, that there are (at least) two other central Asian restaurants in Chicago? Don't feel bad if you didn't. 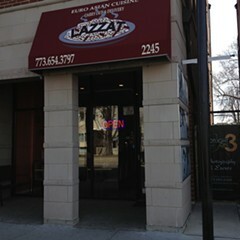 Bai Cafe on Ashland and the newer Lazzat Euro Asian Cuisine in North Center operate on the down-low, serving a majority-cabbie clientele, and remaining pretty much unmolested by thrill-seeking foodlums. 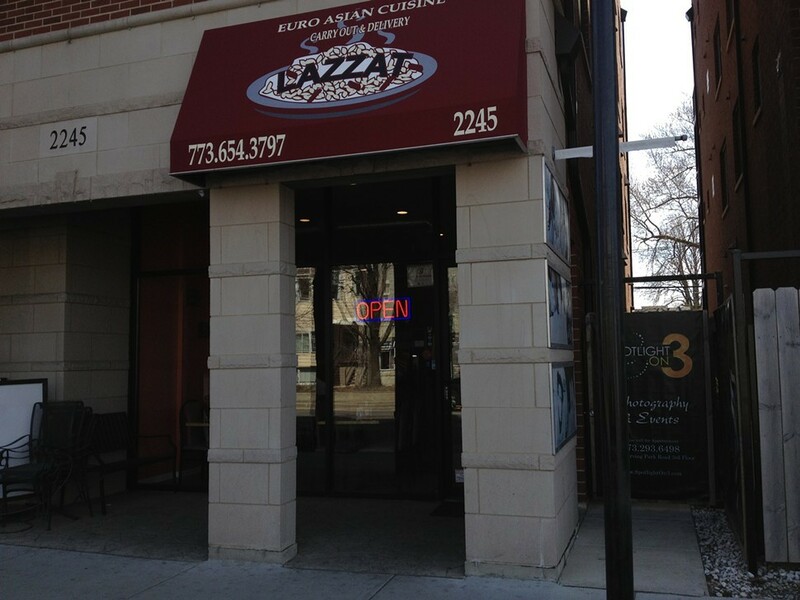 That's particularly true of the newer Lazzat—which could easily be confused with an Indian restaurant of the same name in Streamwood, or even Luzzat in Rogers Park—and which was quietly installed in the snug space once inhabited by Mio Bento on Irving Park Road. The menu features an array of central Asian and Russian dishes: beef, lamb, and chicken kebabs, primarily; a handful of meaty soups all based on the same thin, dill-flecked lamb broth; and bulging ground beef and lamb dumplings known as mantu (aka manti). These are executed variously, and not often with the same level of love that goes into the food at Jibek Jolu. A big plate of tough goulash smothers a triple-carb threat of penne, mashed potatoes, and rice. 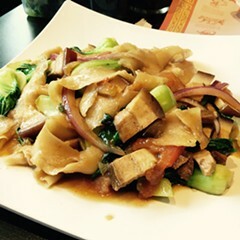 One day the dumplings might be tight and pregnant with filling, and on another falling from disintegrating wrappers. But if you order carefully, you can find some nice things: like the house-made bread, which comes to the table gratis; the cuminy shredded-carrot salad; and the plump Uigur-style beef pelemi bobbing in lamb broth. But the primary reason to get excited about Lazzat is its lagman, which is the reason I added it to my list of handmade noodles to obsess over in this week's Reader. I think it's actually better than Jibek Jolu's in the sense that the superlong, tensile wheat flour tentacles have some slight irregularity to them, which contributes to a superior chewiness. 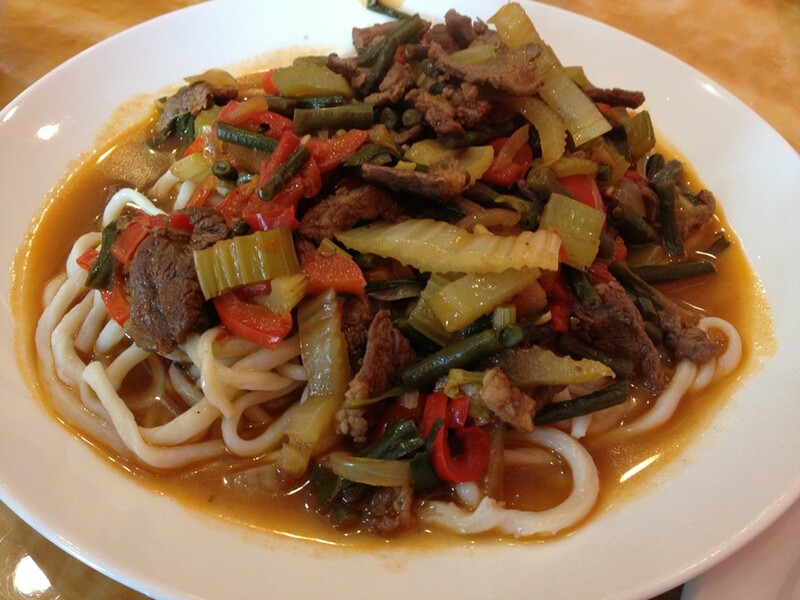 Unlike the noodles of the great Anora Khudayberdeva,* I didn't see them made to order on each occasion I had them, but they are still very good, doused in a savory, soupy hot stew of sliced vegetables and beef. A very generous three-fourths order goes for $6.99, which is an outstanding deal given the regular size is a full $3 more. 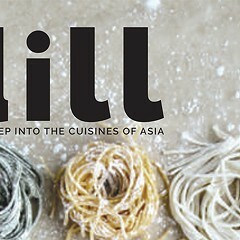 Making hand pulled noodles (lagman) at Chicago's Jibek Jolu from mike sula on Vimeo.